After an unusually long winter in Vancouver, spring almost never happened as summer is bursting on the horizon. 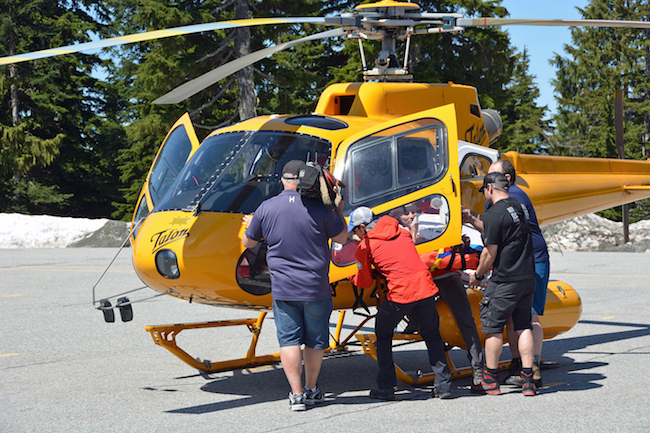 On the last Saturday in May, 1,000 metres above the city, North Shore Rescue (NSR) hosted the Vancouver media for a demonstration of the advanced medical equipment they can deploy on rescue missions into the rugged backcountry wilderness that lies within minutes of this metropolis. More than a metre of snow still covered the ground at the edges of the parking lot, weeks later than most years. A bright yellow Talon AStar A350 circled and landed in the parking lot, signalling the start of the event. Kandys Merola, executive director of TB Vets Charitable Foundation, an organization that has been a long-time supporter of NSR, joined Mike Danks, NSR team leader. The latest donation has allowed NSR to purchase a second Zoll X Series monitor/defibrillator that can be used in conjunction with their Zoll Autopulse and Oxylator ventilator. 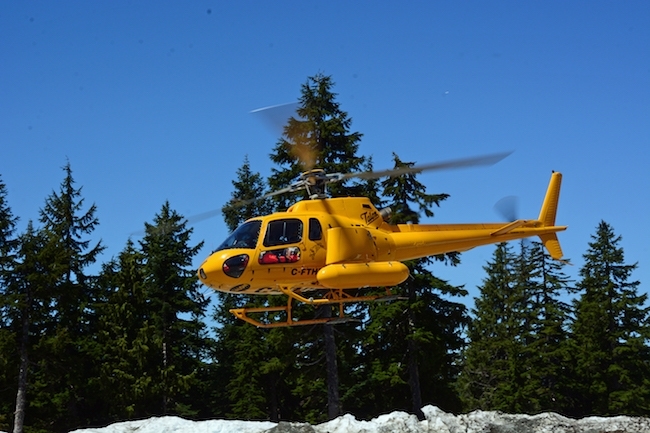 Members of NSR’s advanced medical team spoke of the efficacy of the technology; the ability to initiate resuscitation efforts in the most challenging settings and maintain resuscitation from the moment of first contact, through helicopter extraction until the patient is delivered to the next level of medical care. Dr. Alec Ritchie, NSR team member and emergency physician at North Vancouver’s Lions Gate Hospital (LGH), demonstrated the Autopulse, emphasizing that the machine gives a much more consistent level of CPR that any human could and will continue delivering compressions far beyond the endurance of a human as well as in situations where humans would not be physically capable of doing heart compressions. Another team member, LGH nurse Kayla Brolly, demonstrated the Zoll monitor/defibrillator with team leader Danks as the subject. Fortunately, all vital signs were present and no shock was required. 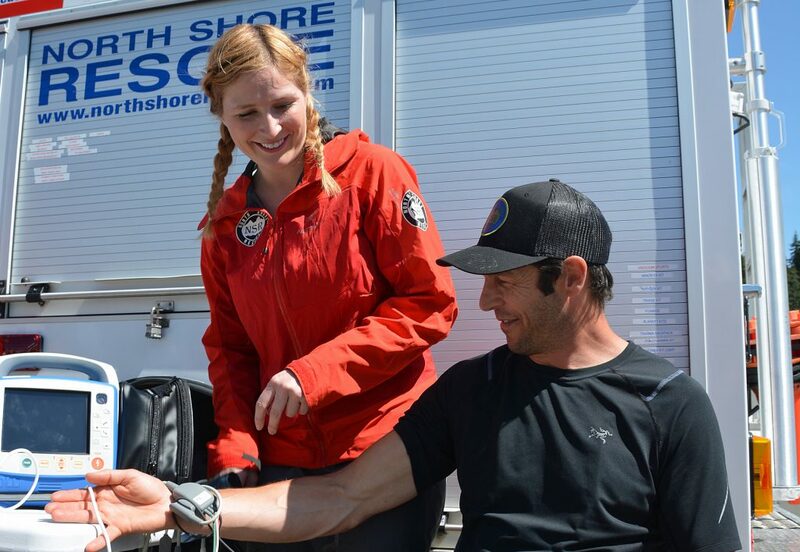 Using a training dummy, a simulated medevac was performed with the medical team using the Autopulse and monitor. With the assistance of other team members the “patient” was packaged and then loaded on to the waiting Talon helicopter, which then departed with the patient and medical team.